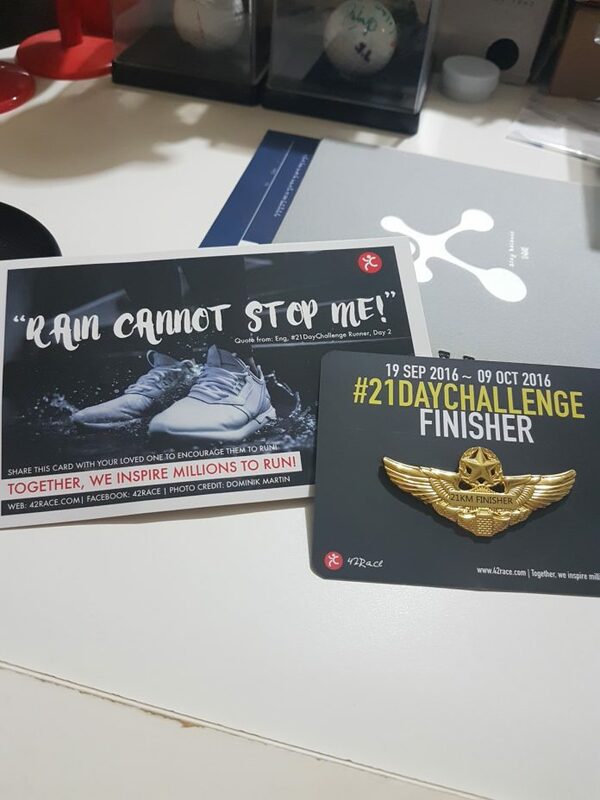 Race Review: 21 Day Challenge Virtual Run (by Jillian) | JustRunLah! This is my first time joining a virtual run, which is something different from my normal races. For the virtual run, there is no specific time and place where you must be to start your run. Basically, everything is own time own target. For this run which I registered under 42Race.com requires us to run at least 21 km to be awarded a finisher pin. Finisher pins will be awarded for 21 km, 42 km and 100 km. There is a specific time frame (21 days) in which you have to complete the runs. The run distance can be added up meaning you can spread out running 21 km over a few days. There are definitely some pros and cons of joining a virtual race in my opinion. The pros are that it kept me motivated to run during the challenge period. As school gets busier, I have often sacrificed my running time for study and even if I do take a break, I’m often too lazy to go for a run (oops!). As such, my stamina suffered and it was evident on the first day where I started running for this challenge. Joining this challenge also pushes me to clock the distance. As I have set a target distance of 5 km for my every run, I make sure I hit it during that running session. As such, I’ve witnessed some improvement in my timing at the end of 21 days. The cons about this race however is that I am unable to experience the joy of running with large groups of people as in an actual race. Running a virtual race is just like running my training runs, only with finisher medals/pins after that. Also, it requires you to upload your timings manually onto the portal to clock your distance meaning that there is a likelihood that there might be some cheaters out there. Although I’d love to believe everyone has practiced their utmost integrity, I am sure some would have succumbed to the temptation of cheating because they missed the target distance by just a few meters or so. The organizer have already assured the runners that they would keep a look-out for these cheaters and have mentioned that those who were suspected of cheating would have their status revoked. Overall, this virtual race was a really unique and fun experience for me and I would like to say that the organizers have really done a great job here. Even though there’s no race pack like some other virtual runs, the beautifully designed pin have already made up for it. Besides this race only cost me $10 and the shipping of the pin is even free. So what more can I ask for! 🙂 In addition, the pin was sent to me only a few days after the end of the challenge, proving how efficient the organizer was. They also do give us the e-certificate for download. hi i would like to ask, how do they send to you your reward? Is it through singpost?